Ouch. Looks like poor Edison may have herself a shiner. And is Robespierre a ghost? Or is it Happy Clown Vanilla Ice Cream? Monday, Stephanie and Edison discuss the recent events. I think you can imagine how that’ll go. But you may be surprised. Well I’m 99% sure that it’s the Happy Clown Ice Cream that’s a ghost now. If Robespierre’s smart (Understatement)he’s acting all innocent as Edison certainly won’t be able to remember all the details. Still the Stephanie & Edison chat’s gonna be really interesting……… This is Friday so Edison only has four days to pull her act together before going to see Dilbert….and four days in this comic line is a long time. By the way the single panel today Cracking! Thank you! I was nervous going in to a full page. I don’t usually like to draw in large spaces. I do hope to speed things up a bit so we can get to Monday (when Edison leaves for Littlecrow and the kids go off to camp), but there’s so much story to get through. Oh dear. I doubt this will go well. I have to say, though, this page might have one of the saddest moods I’ve seen in this comic, at least in my opinion. Her pose and the disheveled state of the room make it seem almost bleak and–to Larry and Stephanie, I’m sure–a little bit frightening. 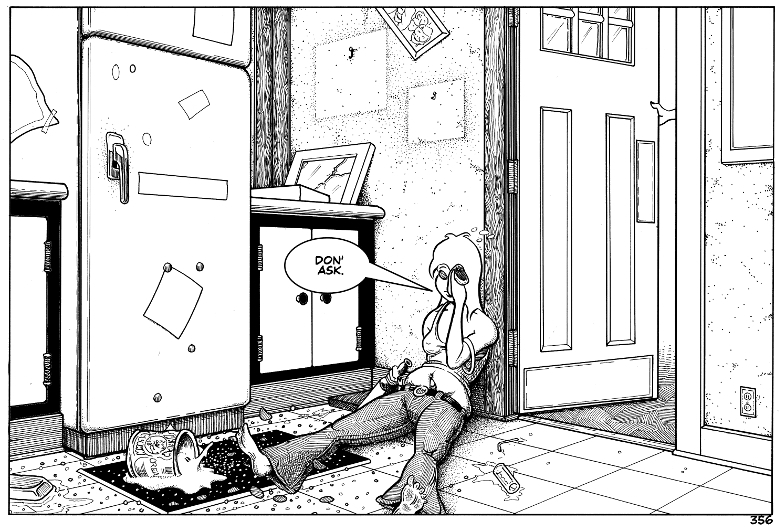 It’s not often you do single-panel stuff like this, but man, you really chose well for today’s layout. I had a whole other drawing half-penciled, but it just wasn’t the right angle. It would be kind of scary to drive home, reassuring Stephanie that everything’s all right, and open the kitchen door to this. *Grumble* Now that I see her lying there with a black eye, I feel a burst of sympathy for Edison, which belies my earlier bloodthirstiness. So I’m a hypocrite? So what? Robie’s alive and probably full of ice cream, so everything is just peachy. You’re not a hypocrite. I’m trying to show characters who aren’t just bad or good. Sometimes people we think are villians turn out to have good (to them anyway) reasons for what they do. And sometimes people we don’t like get in situations that elicit our sympathy. It just means you have a good heart. And you’re a picture framer? I envy you. I’m terrible at it. That is one happy little octopus-like little critter. Edison looks rough, but I am glad she’s okay. I hope. She’ll be okay, more or less. And li’l Robespierre got ice cream! I wonder if he’s ever eaten it before. Six legs makes him a hexapus. Just sayin’. And if he was a kitty, he’d be a hexapussycat! Thanks for that. Robespierre is a sort of land hexapus. I feel cheated. I was expecting Edison to be unconscious at least. If any thing had hit the wall that hard, there would be blood and an impact crater on the wall. My late mom fell in the bathroom and hit her head on the tub. She was stunned and there was blood everywhere where she hit. I guess since Edison was/is so drunk that in essence she is unable to feel any pain. She should have a concussion. Take a look at the panel where she gets hit. She got knocked down before she could hit the wall. Man, if she’d hit the wall, this would go from a (hopefully) comedy to a medical drama! She’d have a skull fracture at least. I hit my head on the gym floor in Boy Scouts once and ended up with a hairline skull fracture. So how did the Pictures fall? If she did not hit them, the freezer door did not do it nor did the books, so how? The pattern is not right. Otherwise, the scene looks good AND painful. And shut the freezer door, and grabbed the bottle and a steak on the way. I think the door hit her and kept going until it hit the wall. Wow. This is a really powerful page, Charlie. The empty frame imprints, the top picture askew, the mess on the floor, and Edison’s body language. And the fact that she’s still clutching onto the bottle. I’ve rarely seen you do a page that speaks so much with so little. Outstanding. Thanks, man. I played with a lot of diffferent layouts, and finally went with this one. I needed to show Edison, her eye, Robespierre, the floor, the door, and the fridge, plus convey the emotion.